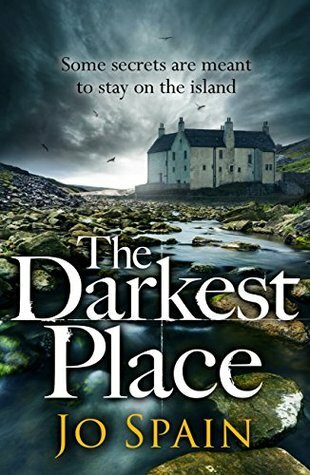 The Darkest Place is Jo Spain’s 4th Inspector Tom Reynolds Mystery book and although I haven’t read the first three I was keen to read this book when I saw it offered on NetGalley as I’d enjoyed her standalone book The Confession. As I expected there are references to the cases Tom Reynolds and his team investigated in the earlier books and it’s probably best to read those first, but actually this didn’t affect my enjoyment of this book. Forty years was too long to wait for somebody to come back from the dead. But still, she liked to get everything ready. Just in case. The ‘somebody’ is Conrad Howe, who was one of the senior doctors at St Christina’s asylum on Oilean na Coillte, known to locals as the island of lost souls, an island (fictional) off the south-west corner of Ireland. His wife, Miriam had never given up hope that he was alive and would return home. The psychiatric hospital was closed down years ago, but now there are plans to build a retreat on the island, an exclusive hotel, and during the demolition work a mass grave for the patients had been uncovered. Conrad’s body was found, hidden beneath some of the body bags and it was obvious that he had been murdered. The narrative alternates between the police investigation and extracts from the diary Miriam had found hidden in the attic, describing what was happening at the hospital and the horrific treatment some of the patients were subjected to by one of the doctors. A few of the hospital staff, including the former head of St Christina’s, Dr Lawrence Boylan and an ex-nurse, Carla Crowley, and it is soon clear that something evil is still going on at the asylum. This really is a chilling book and in parts I found it disturbing and difficult to read. Jo Spain makes it clear in her Acknowledgements that although this is crime fiction it is based on fact – such terrible things really did happen in mental institutions, housing vulnerable people. They were patients with dementia, deformities, depression, epilepsy and homosexuals – people whose families could not deal with them and they were treated mainly as though they were suffering from a physical illness or disorder, that could be fixed. Those that couldn’t be fixed were kept locked up. For most of the book I kept wondering what had actually happened to Conrad Howe and suspecting various people of killing him, mainly thinking it was one particular person until halfway into the book, then thinking it couldn’t be that one. I was right about that, but it was only just before the truth was revealed that I had the slightest suspicion of what had really happened, which makes it a very satisfying book indeed. I’m now on the lookout for more books by Jo Spain. Thanks to Quercus Books and NetGalley for provided a review copy of this book.